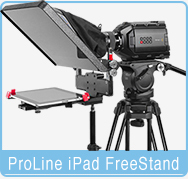 The FreeStand UltraFlex 12 is compatible with all models of iPads up-to 12.9" including the iPAD PRO. 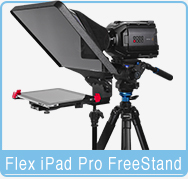 The FreeStand UltraFlex 12 is also compatible with all Surface models including the all new Surface Pro. 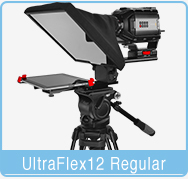 The UltraFLEX 12 FreeStanding teleprompter is compact and sets up quickly with tool-less control of camera position and includes a Bluetooth wireless keyboard remote. 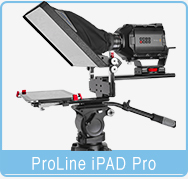 Our iCUE prompting app is available from the app store. Self-contained prompting with no need to connect to a laptop. 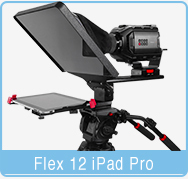 The UltraFLEX FreeStanding teleprompter is a compact, rugged affordable teleprompter for use with DSLR’s and compact HD cameras. It’s design utilizes custom aluminum extrusions for high strength, featuring lightweight and tool-less setup and operation. 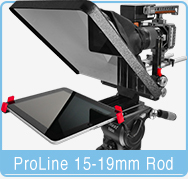 The unique design offers perfect balance for any size camera - from DSLR’s and palmcorders to HD cameras. 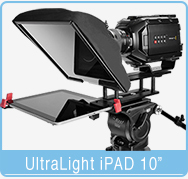 The universal iPAD bracket fits all models of iPADs, Surface and many android tablets.